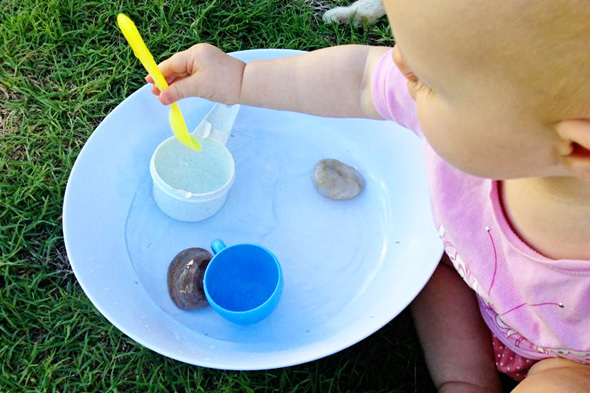 Water play is probably my most favourite sensory activities for children of all ages, there is just something so engaging and relaxing about playing with water. 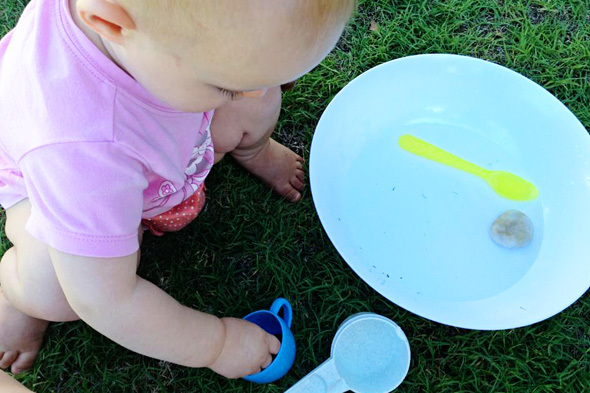 I have introduced water play with both of my babies once they are able to sit reasonably well and as it takes mere minutes to gather a few accessories and a shallow splash of water it is one of my go-to activities for times when little ones are particularly fractious or unsettled. Babies don’t need a lot of water but it can be a good idea to keep an extra supply nearby in case it does get tipped out. 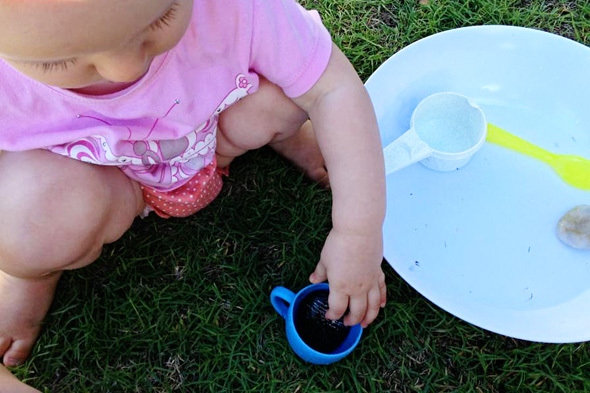 Pour the water into a small, shallow sided bowl so that it is easy for them to access and reach any accessories. Keep accessories simple. I like to add two or three small containers that are easy to hold, a spoon or small ladle and a few smooth, flat river stones. Make sure you choose larger stones that do not constitute a choking hazard. 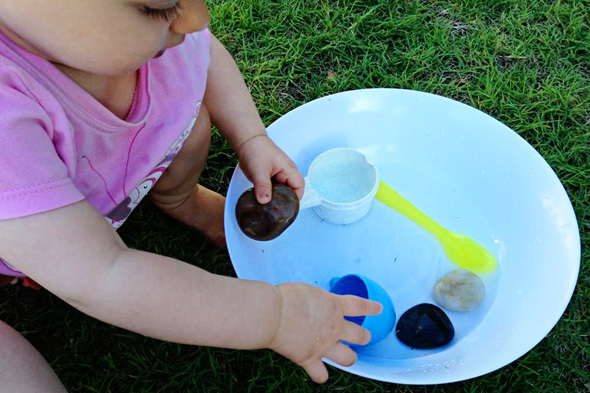 If you do not have any suitable stones, a few plastic blocks or shapes will work as a substitute. Your baby will probably get a little wet so be sure to dress them in play clothes that won’t bother you too much if they get messy. If it is really hot and you have a shady spot, just a nappy is perfect. You may also like to keep a towel nearby for a dry off once you are done. In cooler weather, sit your baby somewhere sheltered, popping them down on a beach towel if you are inside or on bricks or decking, and use warm water instead of cold. Sit back and watch your child explore and learn as they play. 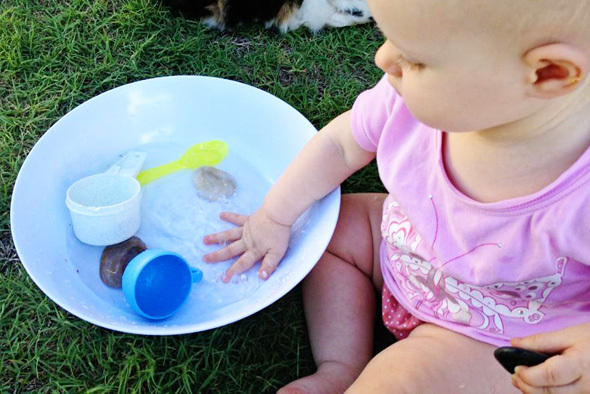 Does your baby like to play with water? 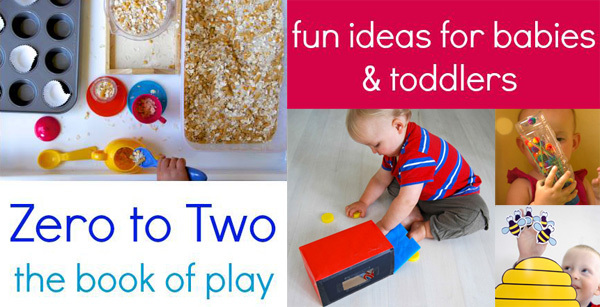 Find fresh, inspiring play ideas for little ones in the eBook, Zero to Two: The Book of Play. I love this idea, I have a little water baby that is 9 months old. It's a beautiful sunny day here in Adelaide so I am going to give this a go this afternoon, I know he's going to love it. Great to see AJ enjoying herself puddling in water, it is a very relaxing and yet great learning opportunity. I also love that Milly is close by in some of the photos, I bet until she got wet! 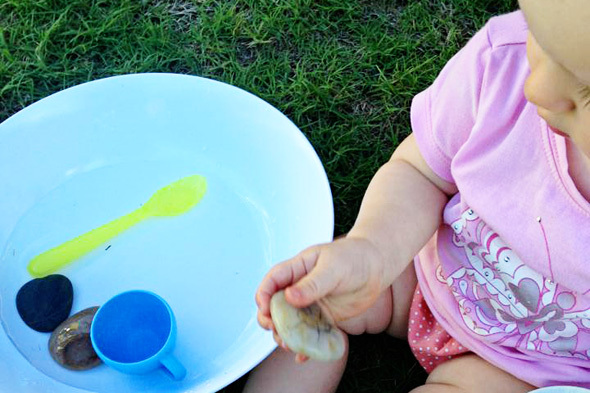 Water play is one of the best activities even for older kids. When I was an early childhood teacher years ago, I always had a water table and it was one of the most popular activities. I would always add different things depending on the kids ages and then would sometimes add worksheets for them to do like what sinks and what floats. When my own kids were little I would try to give them lots of extra bath time with funnels and great water toys as well. Water time at the sink usually ended up being water time all over the kitchen floor. Anything to do with water my 2 kids used to love to play with and would spend hours either splashing, pouring, washing, swirling and other things they would roleplay. This was so helpful on those days they were a tad unsettled as it would calm them or on those super hot days to cool them down.